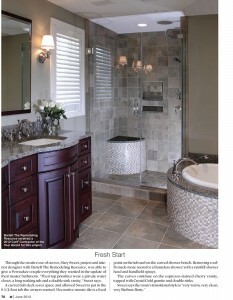 Check out two of Bartelt’s recent bathroom remodels in the “Dwellings” section of M Magazine’s June 2013 issue. Both Matt Retzak and Mary Sweet are quoted, discussing the features of the updated spaces. See the “Dwellings” section, pages 75 – 79, here. This entry was posted in In the News and tagged Bathroom Remodels, Bathtub, Calcutta Marble, Delafield Remodeler, Dwellings, Fox Point Bathroom Remodel, Fox Point Remodel, Frameless Shower, Free-Standing Tub, Freestanding Tub, Granite, Handheld Shower Spray, Home Improvement, Kallista, Kohler, Lifestyle Magazine, M Magazine, Marble, Milwaukee, Milwaukee Remodeler, Pewaukee Bathroom Remodel, Pewaukee Remodel, Porcelain, Rainfall Shower Head, Shower, Tile, Vanity, Waukesha Remodeler, Wisconsin Remodeler on May 28, 2013 by amanda. Today it was announced that we won two 2013 Regional Contractor of the Year (CotY) Awards from the National Association of the Remodeling Industry (NARI). These awards are given each year by NARI Headquarters to NARI members who have demonstrated outstanding work through their remodeling projects. We won in Region 3, a region that includes contractors from Illinois, Iowa, Kansas, Minnesota, Missouri, Nebraska, North Dakota, South Dakota, and Wisconsin. Now, we’re up for a National CotY, which will be announced at the National NARI Evening of Excellence on April 12. We would again like to thank our outstanding team, trade partners, and customers for helping us design and build such beautiful spaces! These awards are the result of the creativity and dedication of everyone. This entry was posted in Awards, In the News and tagged Addition, Awards, Bathroom, Contractor of the Year, CotY, Delafield Remodeler, Master Bath, Master Bathroom, Milwaukee Remodeler, NARI, National Association of the Remodeling Industry, Pewaukee Bathroom Remodel, Pewaukee Remodel, Sunroom, Waukesha Addition, Waukesha Remodel, Waukesha Remodeler, Wisconsin Remodeler on January 29, 2013 by amanda.